Spices Boxes are specially designed for gifting purpose. 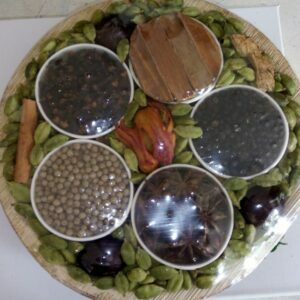 It Contain verities of spices from Kerala.It includes cardamom, black pepper, white pepper, clove, nutmaice, nutmeg, ginger,cinnamon, staranice, etc. Spices kept in Eco-friendly of Palm leaf plates made from the leaves of “Adaka Palm” (Malayalam name of Areca nut palm). Because of its container and divisions of Wooden and plastic spices box, it can use in Kitchen to keep spices. This spices boxes can be used for giving as gift to friends, your customers, relatives.We will pack according to your requirements if it is for gifting. Please mention in order Note if it for gifting purpose.